This handbook reviews component wear, and guides the reader through solutions to wear problems, testing methods for materials and wear mechanisms, and information on wear performance of different materials for components. The bottom line is that it helps to reduce ""the bottom line"" removing risks associated with changes to machinery. This book is based on practical use. 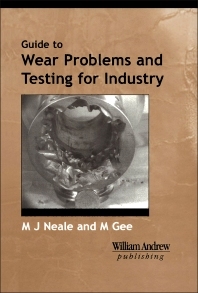 It outlines the following practices: reviews of wear mechanisms that occur in various types of machinery and solutions to industrial wear problems; guides to relative wear performance of different component materials; comparison of the wear performance of those materials; reviews of laboratory tests to simulate wear, and selection of appropriate tests; identification of improved materials, and; examination of worn surfaces. This book is an invaluable everyday reference for engineers throughout manufacturing. Its focus is on alleviating the costs associated with machinery wear.